The strategy at your organization is nonexistent, and you’re assigned to find a strategic planning model to consider. Your company-wide strategy is in place, but entirely ineffective—and you have a hunch that using a strategic planning model will make a big difference. Your organization-wide strategy is fine, but there’s one area in your business environment (or internal process) that needs to be realigned with your strategy. If you can identify with one of these scenarios, this article is for you! Below are 13 of the most popular and effective strategic planning models out there. Objectives, which are high-level organizational goals. Measures, which help you understand if you’re accomplishing your objective strategically. Initiatives, which are key action programs that help you achieve your objectives. 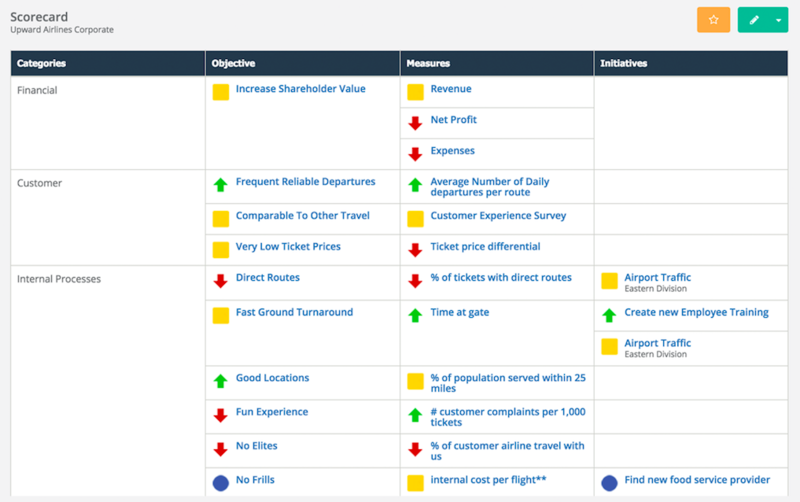 There are many ways you can create a Balanced Scorecard, including using a program like Excel, Google Sheets, or PowerPoint or using reporting software. For the sake of example, the screenshot below is from ClearPoint’s reporting software. 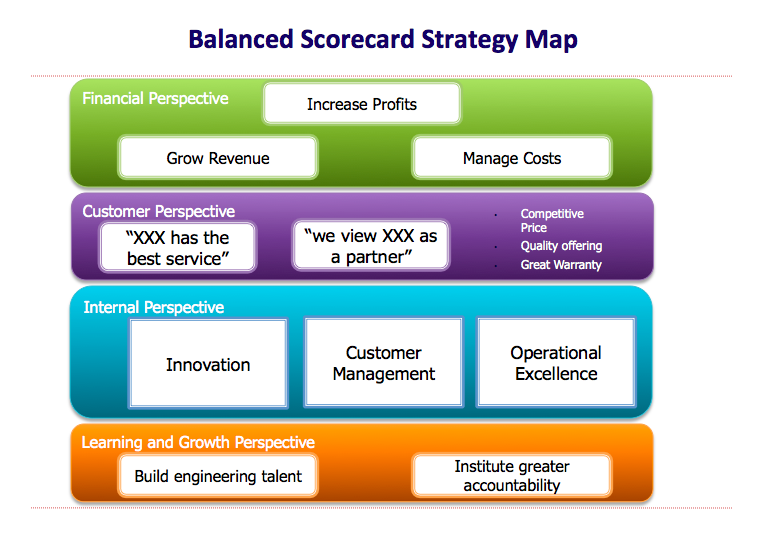 All in all, a Balanced Scorecard is an effective, proven way to get your team on the same page with your strategy. A strategy map is a visual tool designed to clearly communicate a strategic plan and achieve high-level business goals. Strategy mapping is a major part of the Balanced Scorecard (though it isn’t exclusive to the BSC) and offers an excellent way to communicate the high-level information across your organization in an easily-digestible format. It provides a simple, clean, visual representation that is easily referred back to. It unifies all goals into a single strategy. It gives every employee a clear goal to keep in mind while accomplishing tasks and measures. It helps identify your key goals. It allows you to better understand which elements of your strategy need work. It helps you see how your objectives affect the others. A SWOT analysis (or SWOT matrix) is a high-level model used at the beginning of an organization’s strategic planning. It is an acronym for “strengths, weaknesses, opportunities, and threats.” Strengths and weaknesses are considered internal factors, and opportunities and threats are considered external factors. Using a SWOT analysis helps an organization identify where they’re doing well and in what areas they can improve. If you’re interested in reading more, this Business News Daily article offers some additional details about each area of the SWOT analysis and what to look for when you create one. Like SWOT, PEST is also an acronym—it stands for “political, economic, sociocultural, and technological.” Each of these factors is used to look at an industry or business environment, and determine what could affect an organization’s health. 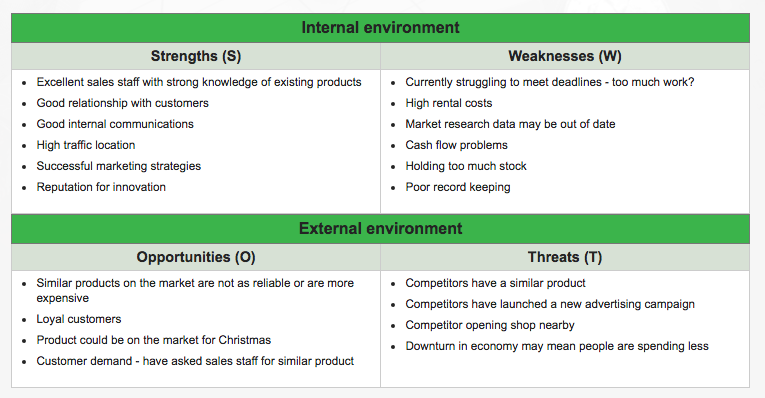 The PEST model is often used in conjunction with the external factors of a SWOT analysis. You may also run into Porter’s Five Forces (see #7 below), which is a similar take on examining your business from various angles. Gap planning is also referred to as a “Need-Gap Analysis,” “Need Assessment,” or “the Strategic-Planning Gap.” It is used to compare where an organization is now, where it wants to be, and how to bridge the gap between. It is primarily used to identify specific internal deficiencies. Blue Ocean Strategy is a strategic planning model that emerged in a book by the same name in 2005. The book—titled “Blue Ocean Strategy: How to Create Uncontested Market Space and Make Competition Irrelevant”—was written by W. Chan Kim and Renée Mauborgne, professors at the European Institute of Business Administration (INSEAD). 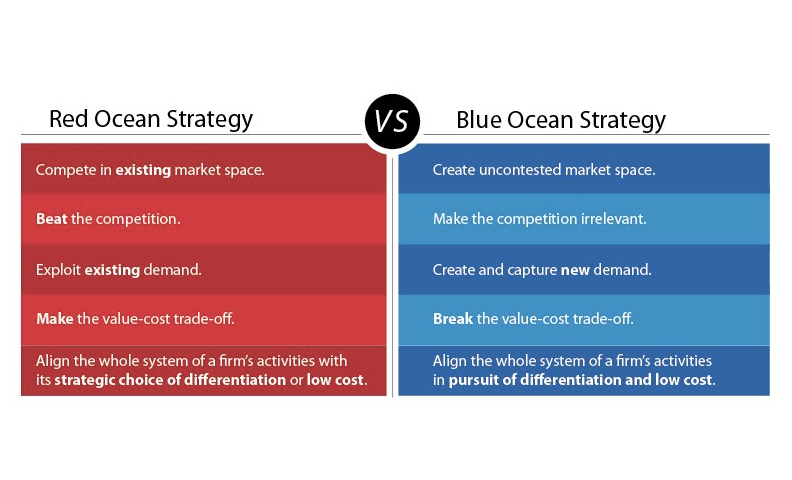 The idea behind Blue Ocean Strategy is for organizations to develop in “uncontested market space” (e.g. a blue ocean) instead of a market space that is either developed or saturated (e.g. a red ocean). If your organization is able to create a blue ocean, it can mean a massive value boost for your company, its buyers, and its employees. For example, Kim and Mauborgne explain via their 2004 Harvard Business Review article how Cirque du Soleil didn’t attempt to operate as a normal circus, and instead carved out a niche for itself that no other circus had ever tried. The threat of entry. Could other companies enter the marketplace easily, or are there numerous entry barriers they would have to overcome? The threat of substitute products or services. Can buyers easily replace your product with another? The bargaining power of customers. Could individual buyers put pressure on your organization to, say, lower costs? The bargaining power of suppliers. Could large retailers put pressure on your organization to drive down the cost? 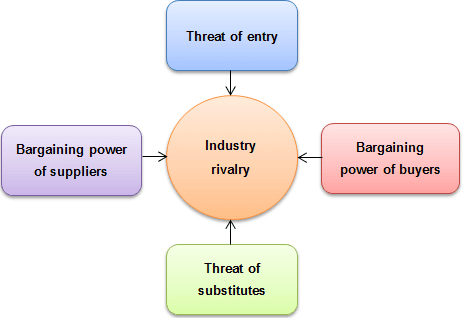 The competitive rivalry among existing firms. Are your current competitors poised for major growth? If one launches a new product or files a new patent—could that impact your company? The amount of pressure on each of these forces can help you determine how future events will impact the future of your company. The VRIO framework is an acronym for “value, rarity, imitability, organization.” This strategic planning process relates more to your vision statement than your overall strategy. The ultimate goal in implementing the VRIO model is that it will result in a competitive advantage in the marketplace. Value: Are you able to exploit an opportunity or neutralize an outside threat using a particular resource? Rarity: Is there a great deal of competition in your market, or do only a few companies control the resource referred to above? Imitability: Is your organization’s product or service easily imitated, or would it be difficult for another organization to do so? Organization: Is your company organized enough to be able to exploit your product or resource? Once you answer these four questions, you’ll be able to formulate a more precise vision statement to help carry you through all the additional strategic elements in your plan. The Malcolm Baldrige National Quality Award is “the highest level of national recognition for performance excellence that a U.S. organization can receive.” Created in 1987, the goal of Baldrige is to help organizations innovate and improve, while achieving their mission and vision. The award is currently open to manufacturing, service, small business, nonprofit, government, education, and healthcare sectors. 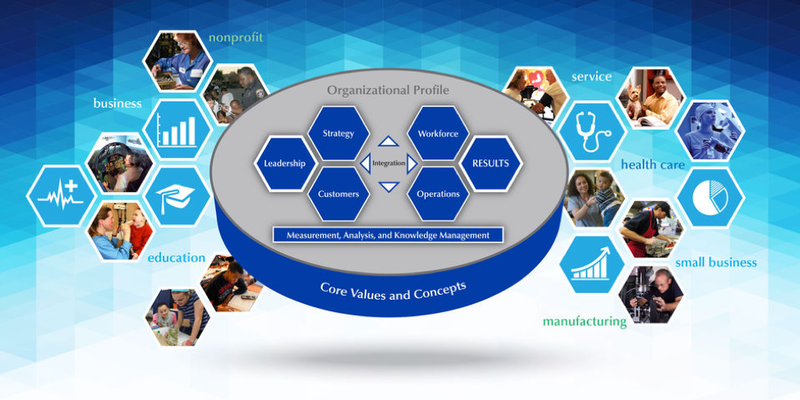 To implement the Baldrige framework in your organization, start with two questionnaires that help you self-assess based on the seven Baldrige Criteria categories, and get a snapshot of your strengths and opportunities for improvement. Objectives: What you want to achieve. Choose three to five objectives that are brief, inspiring, and time-bound. Key Results: How you’ll measure progress toward your achievements. Set three to five key results (they must be quantitative) per objective. This model is effective in part because of its simplicity; it also employs a “reverse” hierarchy that works to gain buy-in and alignment from the ground up. You begin by setting OKRs at the employee level and then flow upward through the management levels. The OKR framework is also effective because goals are continually set, tracked, and re-evaluated so organizations can quickly adapt when needed. This is a fast-paced, iterative approach that flips the traditional top-down strategic models. The Hoshin Planning approach aligns your strategic goals with your projects and tasks to ensure that efforts are coordinated. This strategic management model is less focused on measures and more on goals and initiatives. Identify key goals. Ideally you’d focus on three to five goals. Play “catchball.” Share goals from top to bottom of your organization to obtain buy-in. Gather intel through “gemba.” Track the execution of your key goals and gather feedback from employees, using a defined process. Make adjustments. Initiate change based on feedback and repeat the steps of catchball and gemba. 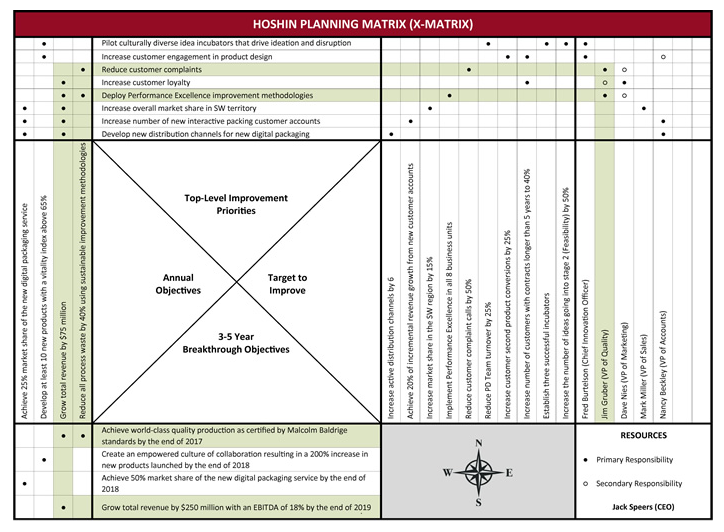 You visualize your objectives, measures and targets, measure programs, and action items in a Hoshin Planning matrix. Four directional quadrants (north, south, east, west) inform each other and demonstrate alignment. 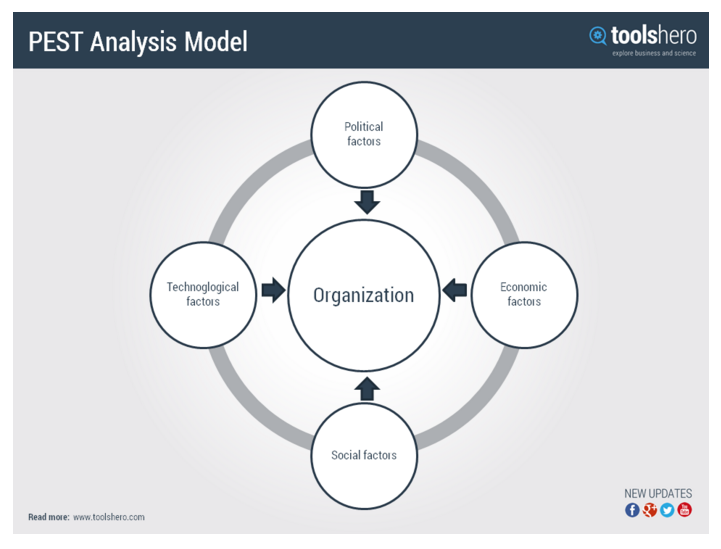 The issue-based strategic model is oriented in the present and projects into the future. It aims to identify the major challenges your organization faces now—in other words, you start with the problems to iron out issues before expanding, shifting your strategy, etc. This is typically a short-term (6-12 months), internally-focused process. Issue-based planning is ideal for young or resource-restricted organizations. The leadership team or stakeholders identify the major issues and goals as a first step. Next, your organization will create action plans to address the issues, including budget allocation. From there, you will execute and track progress. After an issues-based plan has been implemented and the major issues you identified are resolved, then your organization might consider shifting to a broader, more complex strategic management model. Goal-based strategic planning is the reverse of issue-based. This approach works backward from the future to the present. It all starts with your organization’s vision. By nature, vision statements are aspirational and forward-thinking, but they need specifics in order to be realized. Goal-based planning tackles that challenge by setting measurable goals that align with your vision and strategic plan. Next, you define time frames for goal achievement. This is a long-term strategic planning tool, so goal time frames are typically about three to five years. From there, stakeholders will create action plans for each goal and begin tracking and measuring progress. 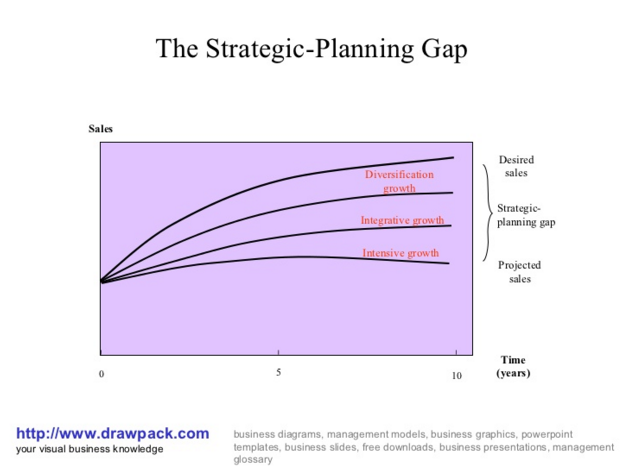 Is one strategic planning model better than the others? That’s a great question—and the answer isn’t cut and dried. Some of these frameworks have been around longer than others, or have been used in various case studies in different ways. And sometimes managers are more comfortable with one over another, for any number of reasons. We recommend determining which of these strategic planning models applies most to your organization’s way of thinking. For example, if you still need to work out your vision statement, it may be wise to begin with the VRIO framework and then move to something like the Balanced Scorecard to track and manage your ongoing strategy. If you are set on pitching a particular strategic planning model to management, be prepared to give your boss or board of directors an example of another successful company that has utilized that particular model. An actual demonstration of success will make a somewhat abstract concept become more concrete. If you are evaluating different approaches, I would recommend thinking about both creating your strategic plan and also executing on your plan. It doesn’t do you any good to have a strategic plan and not put it to use. If you have any questions about the planning models above, we’d love to answer them. Tweet us @clearpointstrat, and let’s get your strategy up and running. Previous « Your strategy isn’t stagnant; your software shouldn’t be either!